The options for network camera recording software are a bit limited on Mac OS. The two most popular products in this space are Evological’s EvoCam and Bensoftware’s SecuritySpy. On price alone you might be tempted by EvoCam as it costs just $30 (under £20) for an unlimited number of cameras, while SecuritySpy will set you back £30 for a single camera license and a whopping £500 for unlimited camera support. I’ve had an opportunity to evaluate both products and have come to the conclusion that you really do get what you pay for. EvoCam does the job well enough and has a more polished user interface, but it also suffers from a major problem that lets it down badly, almost to the point of being unusable. For reasons unknown it ties up the processor for even a simple one camera recording setup. 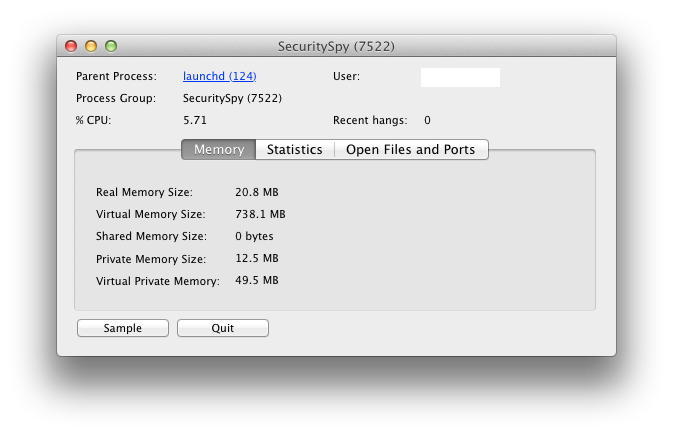 In these examples (from a Mac Mini 2.26GHz Intel Core 2 Duo with 4GB RAM), EvoCam consumes 85% CPU and 90MB real memory, while in comparison SecuritySpy consumes a meagre 6% CPU and 21MB real memory. That’s quite a difference and it’s very noticeable when you try to use the same host machine for other work. So if you have the luxury of a dedicated powerful server for your camera recording then EvoCam is probably the most cost effective option, but if you want something that works reliably and doesn’t take over your machine then SecuritySpy is well worth the extra investment. This entry was posted in Apple, General, Reviews, Security, Techie and tagged Bensoftware, CCTV, EvoCam, Evological, mac os, SecuritySpy by djh. Bookmark the permalink. Evological has a pretty decent site and what seems to be some pretty cool software but their customer service appears to be non-existent. I have emailed them 8 times over the past many days and have received ONE response (from Nick). His email said he’d be happy to help and since then he’s disappeared. I looked them up in BetterWhoIs and found a different email address to email them and the email was returned as undeliverable. That’s the email address on record as being the owner/controller of the website. There is no phone number at their website for support and no support form at their website. I’m using the 15-day trial and I was going to purchase the software but no matter how good it might be if I have a problem I need support. I don’t know if something happened to “Nick” and he’s the only guy there and so Evological isn’t going to be in business any longer or what but I can’t purchase from a company that has no support and no customer service. I’m really disappointed because the software seems pretty cool. Don’t waste your time with Evocam. Like this article points out it is much more CPU consuming than SecuritySpy. It is better supported and maintained. More cameras are “supported”.